The OS I was testing with was Windows Server 2003 x32 with 2.5 GB of RAM. I was testing paged/nonpaged pool leaks, and I was curious about how the memory manager handles allocations and commits after the startup initialization. 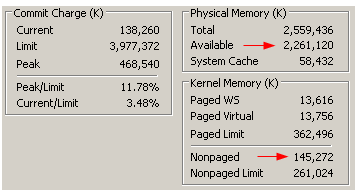 It looks like it allocates about 120 MB to the nonpaged pool upon startup (in this example for this server), and then begins doing memory commits to the kernel address space – but when nonpaged pool requests increase past that amount, it will begin to allocate only the exact amount that is being requested and nothing more. 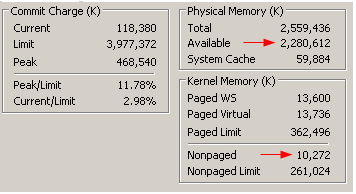 Notice the available RAM is 2,277K, and the nonpaged pool is 10.2K. Notice now the available RAM is now 2,261K, and the nonpaged pool is 145K. This entry was posted on June 26, 2011, 10:12 pm and is filed under Windows Internals. You can follow any responses to this entry through RSS 2.0. You can leave a response, or trackback from your own site.